Here is a gorgeusly designed and animated, extremely bizarre stop-motion animation for the petroleum industry from the demented mind of Charley Bowers, the man who made the previously posted and equally bizarre Metal Eating Bird. 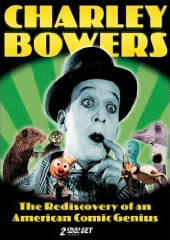 Note that you can get a dvd called Charley Bowers: The Rediscovery of an American Comic Genius (1926), which includes all of the Bowers films known to still exist here. A fun 1933 Van Beuren cartoon, with Mae Questel doing a voice for a studio other than Fleischer. A great, great short by Ladislaw Starewicz, The Mascot, in three parts. I posted a short excerpt from this cartoon previously… this is the full cartoon at a much better quality. The Mascot is one of the most bizarre and beautiful puppet animations I’ve ever seen. And it has a monkey! Don’t miss it! Read more about Ladislaw Starewicz at Animation Heaven and Hell. Read more about Ladislaw Starewicz at Wikipedia. See a tribute site to Ladislaw Starewicz made by his granddaughter. For more old cartoons with monkeys, go here. A particularly strange Flip the Frog cartoon in which our hero gets plastic surgery. Director Bob Clampett at his craziest… and they didn’t get any crazier than Clampett. This is one of my favorite cartoons. Here is an utterly bizarre short by the largely forgotten animator and actor Charley Bowers. You have to skip over the excessively obnoxious first 40 seconds to get to the film. The fantastic animation isn’t until the last half of the film. Read more about this film on the Internet Movie Database. Who is Charley Bowers? The inventor of the no-slipping banana skin, unbreakable eggs, and cat-pushing trees! At the end of the 1920s, this unknown genius created and directed a score of cinematic burlesques filled with surrealist imagination, crammed with fantastic sights and animated puppets, among which the most delicious include “Egged On,” “Fatal Footstep” and “Now You Tell One.” His body of work is unique, though the astonishing course his career took has been chronicled by few and left him as one of the more enigmatic figures of American cinema. After a childhood spent with the circus, he became interested in animated drawing, adapting comic strips for the cinema including the “Mutt and Jeff” series created by Bud Fisher. Advances in animation which developed during this period explain the astonishing illusions which emerged in these comedic shorts. In the 1930s he directed “It#s a Bird,” his first sound film. 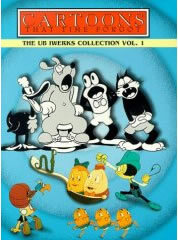 Bowers returned to animation for advertising films, in particular the first short film by Joseph Losey, the oil-commissioned “Pete Roleum and His Cousins,” while also continuing his puppet films. He died in 1946, completely forgotten. To this day, 11 of the 20 short comedies are still considered lost. At the end of the 1960s, vault discoveries provided more of his story and three of the exhumed films were shown in 1976 at the Annecy Animated Film Festival, where they were met with enthusiasm. After 1992, worldwide research retrieved surviving prints of the missing films with requests to the world#s notable cinema collectors, who allowed access to their original elements. For the first time this extraordinary collection assembles the complete films of Charley Bowers which survive today, magnificently restored from the original elements with the collaboration of ten cinema societies. The pink elephants sequence from Dumbo is one of my favorite pieces of Disney studios animation… great music too.